John Raleigh Mott (May 25, 1865 – January 31, 1955) was a long-serving leader of the YMCA and the World Student Christian Federation(WSCF). He received the Nobel Peace Prize in 1946, for his work in establishing and strengthening international Christian student organizations that worked to promote peace. His co-recipient that year was Emily Greene Balch. From 1895 until 1920, Mott was the General Secretary of the WSCF. In 1910, Mott, an American Methodist layperson, presided at the Edinburgh Missionary Conference, which launched both the modern missions movement and the modern ecumenical movement. From 1920 until 1928, he was the Chairperson of the WSCF. For his labors in both missions and ecumenism, as well as for peace, some historians consider him to be "the most widely traveled and universally trusted Christian leader of his time" (Cracknell & White, 243). Intimately involved in the formation of the World Council of Churches in 1948, that body elected him as a life-long honorary President. His best-known book, The Evangelization of the World in this Generation, became a missionary slogan in the early twentieth century (Cracknell & White, 233). His ceaseless efforts to promote strong, moral, and visionary leadership among the youth of the world was also an effort to create better understanding across cultural divides. Mott was a bridge builder. Mott was born in Postville, Iowa. He attended Upper Iowa University, where he studied history and was an award-winning student debater. Iowa was a small school affiliated to the Methodist tradition. In 1885, he transferred to Cornell University, where he received his bachelor's degree in 1888. At the time, Mott was contemplating two possible career choices, either in law or in his father's timber business. However, on January 14, 1886, he heard a lecture by John Kynaston Studd, the former English cricket star and co-founder of the Cambridge Mission to China. Studd spoke of the great need to present the gospel among students. Mott became active in the Cornell Young Mens Christian Association (YMCA), which he represented that summer at the first international and ecumenical youth conference. One-hundred young men met from 80 different Colleges, and as a result of this conference, the Student Volunteer Movement for Foreign Missions was launched, which aimed to recruit the brightest and best of America's youth to serve Christ overseas, similar to the Cambridge University Mission. The motto was, "The Evangelization of the World in this Generation," and a great deal of enthusiasm and confidence was generated. Before graduating from Cornell, Mott significantly increased the YMCA's membership and raised enough funds to construct a building near the campus. Certain that he would devote his energy to youth work and to mission, Mott became the National Secretary of the Intercollegiate YMCA, a post he held for 27 years. He soon assumed the chair of the Student Volunteer Movement for Foreign Missions' executive committee and played a pivotal role in the organization's development. Over the next three decades, 13,000 young people would serve as overseas missionaries under the agency's auspices. By 1900, there were more American missionaries in the field than British. The SVM funded schools, hospitals, and orphanages, as well as evangelical work and literature, with its own publishing company. Mott himself traveled to 24 countries and established 70 new associations within a few years of the SVM's creation. Given the strength of the SVM, Mott was ideally placed to move into a leading position within the emerging international ecumenical movement. In 1907, he organized the Tokyo SVM Conference. When William Carey's "pleasing dream" of a world gathering of Protestant mission agencies became a reality at Edinburgh, Scotland, in 1910, Mott was Chair of the conference and subsequently chaired the International Missionary Council established in London in 1921, which went on to organize meetings in Tambaram, India (1938), and in Ghana in 1958, before merging with the World Council of Churches in 1961. In his post as Chair of the IMC, Mott was involved in conversations that led to the creation of the WCC. At a meeting in 1937, at which Mott was present, the decision was taken to establish a world inter-church body but the intervention of World War II delayed this until 1948. When the WCC was finally created, Mott was appointed a life honorary President. Together with George Bell, he can be credited as one of the WCC's founders. Now General-Secretary of the International YMCA, Mott was able to travel widely, visiting the Far East in 1912-13, as well as many European countries. During World War I, Mott was anxious to assist the war effort and volunteered to place the YMCA at the service of the nation. 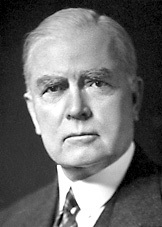 Franklin D. Roosevelt appointed Mott as head of the National War Work Council, having previously offered him a diplomatic post in China. Mott also served as a member of government missions to Mexico (1916) and to Russia (1917). The venerable John Mott is among us today because he has created worldwide organizations which have united millions of young people in work for the Christian ideals of peace and tolerance between nations. He has never been a politician, he has never taken an active part in organized peace work. But he has always been a living force, a tireless fighter in the service of Christ, opening young minds to the light which he thinks can lead the world to peace and bring men together in understanding and goodwill. His work has always been chiefly among youth, for in them lies the key to the future. They are the leaders of tomorrow. Ingebretsen pointed out that while Mott was a committed Methodist, in all of his many roles as a representative at conferences "he never traveled as a representative of any denomination. He worked among people of every creed and race, and his help and advice were freely available to all." The presentation speech continues, "The work of Mott and his student movement in the cause of peace, goodwill, and understanding between nations was a natural corollary of his view of Christ as the Prince of Peace. The movement's motto had at one time been 'Make Christ King.' And this summarizes Mott's feelings. Christ was the King he served, and the fight he waged was a fight to win the world for the peace which his King wanted to give to mankind." The most trustworthy leader is one who adopts and applies guiding principles. He trusts them like the North Star. He follows his principles no matter how many oppose him and no matter how few go with him. This has been the real secret of the wonderful leadership of Mahatma Gandhi. In the midst of most bewildering conditions he has followed, cost what it might, the guiding principles of non-violence, religious unity, removal of untouchability, and economic independence. Mott, says his Nobel Biography, "crossed the Atlantic over one hundred times and the Pacific fourteen times, averaging thirty-four days on the ocean per year for fifty years." He visited 83 countries, many several times, during his many journeys. Mott authored sixteen books, including The Decisive Hour of Christian Missions, The Evangelization of the World in This Generation, and his Addresses and Papers of John R. Mott. Mott married Leila Ada White in 1891. They had two sons and two daughters. The World Council of Churches, which Mott helped to create, continues his life-long work of building bridges and of trying to make the world itself a safer, more peaceful place. Mott is an example of someone whose life was dedicated to Christian leadership, yet who could also be called upon to serve his government; service for which he was honored by governments throughout the world. ↑ Daniel H. Bays, The Foreign Missionary Movement in the 19th and early 20th centuries. Retrieved July 9, 2007. ↑ Herman Smith Ingebretsen, The Nobel Peace Prize, 1946. Retrieved July 9, 2007. ↑ John R. Mott, Nobel Lecture, 1946. Retrieved July 9, 2007. ↑ Norwegian Nobel Committee, John R. Mott biography. Retrieved July 9, 2007. Mackie, Robert C. Layman Extraordinary: John R. Mott. London: Hodder & Stoughton, 1965. Mott, John Raleigh. The Evangelization of the World in This Generation. New York: Student Volunteer Movement for Foreign Missions, 1900. Mott, John Raleigh. The Pastor and Modern Missions: A Plea for Leadership in World Evangelization. New York: Student Volunteer Movement for Foreign Missions, 1904. Mott, John Raleigh. The Decisive Hour of Christian Missions. New York: Student Volunteer Movement for Foreign Missions, 1910. Mott, John Raleigh. Addresses and Papers of John R. Mott. New York: Association Press, 1946. History of "John Raleigh Mott"
This page was last modified on 22 May 2018, at 14:52.